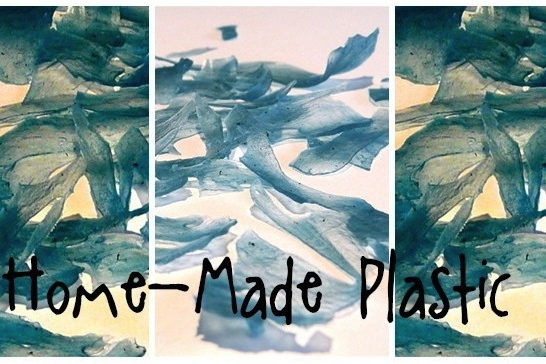 This week we made our own biodegradable plastic and had hands-on (literally!) fun with sticky slime. You have to feel this stuff to believe it. The children had way more fun playing with it than they’d expected. Best of all, it’s so easy – five minutes to make, a whole afternoon of fun! Put a cup of cornflour (cornstarch) into a bowl. 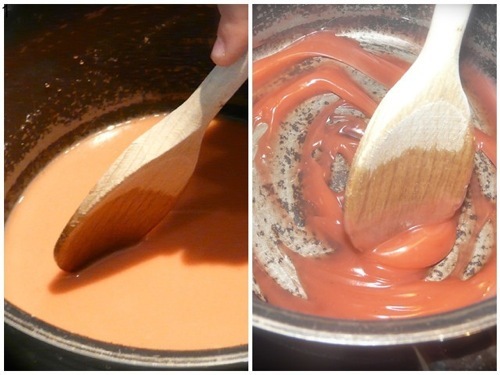 Slowly add water, stirring all the time, until the mixture becomes a sticky paste (add up to about half a cup). Add food colouring and stir to blend. Have fun with your slime! Notice how it both flows like a liquid and sticks together like a solid. 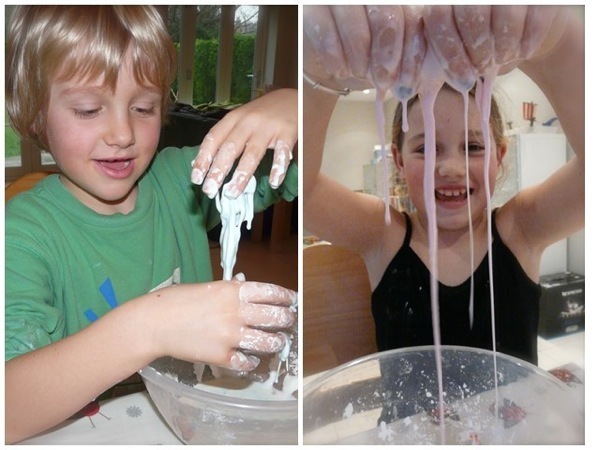 Slime is a “non-Newtonian fluid” because it doesn’t conform to Sir Isaac Newton’s rules about how liquids behave. It’s made of polymers – long chains of simple molecules. When the chains are stretched out the liquid flows, but if you apply pressure the chains stick together. This really is so easy. The only thing we’d do differently would be to be less concerned about the exact amounts of cornflour and water. You can always add more of either (or both). 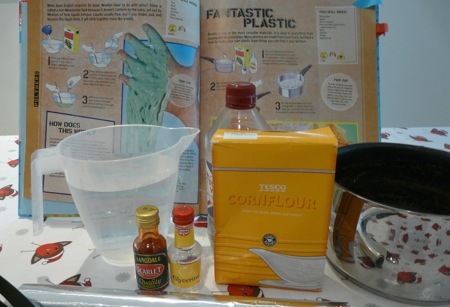 Cornflour is our new favourite science ingredient! Mix together 1 tbsp starch and 4 tbsp water in a saucepan. Add 1 tsp glycerine and 1 tsp vinegar. Put the saucepan on a low heat, stirring constantly. Observe the mixture change from a cloudy liquid to a clear gel. When the mixture is completely transparent and starts to bubble*, use the wooden spoon to spread it out on a sheet of foil. Wait a day for your plastic to set. I forgot to do step 6 for our first batch (I’m not great at reading instructions) so our red plastic came out in globules that would do nicely as fake jam! We might make some uncoloured plastic, to see if it turns transparent in the way the book describes. We might experiment with different quantities of glycerine, which changes the rigidity of the plastic. 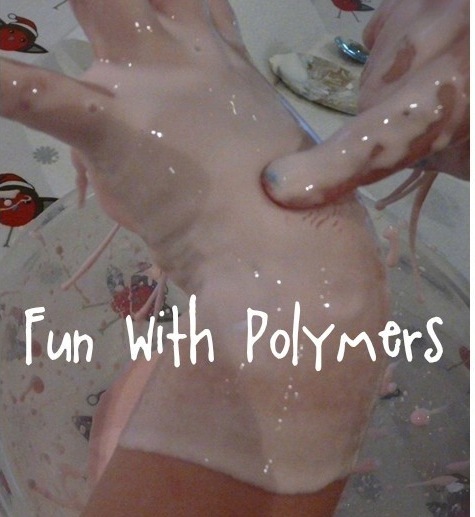 Like slime, plastics are made from polymers. Their chain-like structure makes them flexible enough to mould while soft, then strong when set. What Does Each of the Ingredients Do? Starch contains polymers. Vinegar makes the chains stronger, and glycerine makes them more flexible. Both these experiments come from Science Experiments: Loads of Explosively Fun Experiments You Can Do. We’re very much enjoying our journey through the book. 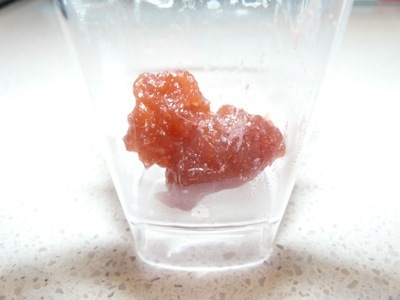 A few of the experiments call for materials that are tricky or expensive to source (dry ice, powdered alum) – we’ll skip those for now – but most are inexpensive household items. I love the way the materials and instructions are clearly laid out with plenty of pictures. We’re linking up with AdventuresInMommydom’s Science Sunday – thanks Ticia for hosting! Oh! 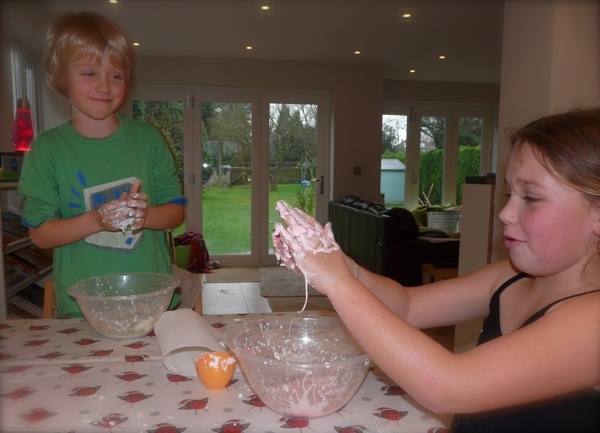 We did the slime last week and my kids LOVED it! Tons of fun!!! Hey, can we come round and you teach my children science and I just sit back, have a cup of tea and relax…….!! LOL 😀 That would be SO MUCH FUN!! We did the plain cornstarch and water one time, and I got an hour of play out of my kids with that alone. I can just imagine if I followed up with this! Thanks, Ticia. I must admit, I think I might be having even more fun than the children with this little flurry of hands-on science we’re doing!